EMF Camp always throws up lots of interesting opportunities and discussions. Apparently in the world of DIY cosmetics there is a shortage of presses for powder compacts. I laser cut a few samples from my acrylic off cuts with varying 'gap' sizes between the tin and the press. The downside to EMF is that I have no idea if these were actually any good for purpose but it was an interesting morning and discussion anyway. One of the EMF projects that didn't make it to completion were these edge lit badges. 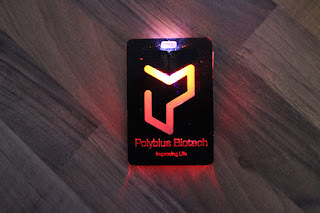 It uses a similar technique to my own EMF badge (black spray paint over fluorescent perspex) except this time the UV led and coin cell is built into the badge. The reason it didn't get to completion is because the led needs a hole all the way through the badge but the LED has to be covered otherwise the eye can't see the subtle fluorescing (the LED is too bright). The prototype used a piece of black tape but it's not exactly an elegant solution. I also tried to cut the whole first, then engraved through a black label over placed over the whole thing but I couldn't get it to cut clean enough. While I was making my wooden crates I ended up having a conversation with a neighbour about a pallet I was eyeing up. 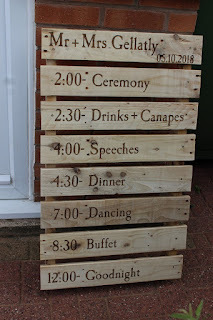 Turns out they were keen to make a Wedding Schedule Pallet but didn't know how they were going to burn the words on, laser cutter to the rescue.